Cultured muscle cells are an inadequate model to recapitulate innervated muscle in vivo. A functional motor unit can be reproduced in vitro by innervation of differentiated human primary muscle cells using rat embryo spinal cord explants. This article describes how co-cultures of spinal cord explants and muscle cells are established. Arnold, A. S., Christe, M., Handschin, C. A Functional Motor Unit in the Culture Dish: Co-culture of Spinal Cord Explants and Muscle Cells. J. Vis. Exp. (62), e3616, doi:10.3791/3616 (2012). Human primary muscle cells cultured aneurally in monolayer rarely contract spontaneously because, in the absence of a nerve component, cell differentiation is limited and motor neuron stimulation is missing1. These limitations hamper the in vitro study of many neuromuscular diseases in cultured muscle cells. Importantly, the experimental constraints of monolayered, cultured muscle cells can be overcome by functional innervation of myofibers with spinal cord explants in co-cultures. Here, we show the different steps required to achieve an efficient, proper innervation of human primary muscle cells, leading to complete differentiation and fiber contraction according to the method developed by Askanas2. To do so, muscle cells are co-cultured with spinal cord explants of rat embryos at ED 13.5, with the dorsal root ganglia still attached to the spinal cord slices. After a few days, the muscle fibers start to contract and eventually become cross-striated through innervation by functional neurites projecting from the spinal cord explants that connecting to the muscle cells. This structure can be maintained for many months, simply by regular exchange of the culture medium. The applications of this invaluable tool are numerous, as it represents a functional model for multidisciplinary analyses of human muscle development and innervation. In fact, a complete de novo neuromuscular junction installation occurs in a culture dish, allowing an easy measurement of many parameters at each step, in a fundamental and physiological context. Just to cite a few examples, genomic and/or proteomic studies can be performed directly on the co-cultures. Furthermore, pre- and post-synaptic effects can be specifically and separately assessed at the neuromuscular junction, because both components come from different species, rat and human, respectively. The nerve-muscle co-culture can also be performed with human muscle cells isolated from patients suffering from muscle or neuromuscular diseases3, and thus can be used as a screening tool for candidate drugs. Finally, no special equipment but a regular BSL2 facility is needed to reproduce a functional motor unit in a culture dish. This method thus is valuable for both the muscle as well as the neuromuscular research communities for physiological and mechanistic studies of neuromuscular function, in a normal and disease context. Establish the human muscle cell cultures according to the explantation-re-explantation technique4. First, remove non-muscle tissue from the biopsies. Then, embed 1 mm3 muscle explants in a coagulum of plasma, which allows fibroblasts to emerge from the explants. The embedded explants are transferred onto a plasma-gelatin coated dish and let them grow in normal growth medium (MEM supplemented with 25% medium 199, 10% fetal bovine serum [FBS], 1% penicillin/streptomycin, 10 μg/ml insulin, 10 ng/ml human epidermal growth factor [EGF], 12.5 ng/ml human fibroblast growth factor [FGF]) in a monolayer. The cells that emerge from the explants under those conditions are muscle cells. These cells will continue to grow in a monolayer after removal of the explants. Culture the cells aneurally on 0.1% gelatin-coated plates in normal growth medium. The cells can be aneurally cultured and amplified as needed. It is better to use muscle cells at a passage between 3 and 8 to perform the co-cultures. It is critical to innervate young myotubes; after this point, the co-cultures have a high risk of failing. Furthermore, myotubes should not be too large and too thick. Two days before the innervation is planned, plate the muscle cells on 35 mm tissue culture dishes (or 6 well plates) at a density of 500,000 cells per dish in normal growth medium. At that density, the cells are at the proper confluency to start the fusion on the following day, and subsequent innervation the day after that. Using those conditions, the myotubes are at the right stage for optimal innervation and hence subsequent fiber contraction. On the next day, replace the normal growth medium with a fusion medium composed of MEM supplemented with 25% medium 199, 5% FBS, 10 μg/ml insulin and 1% of penicillin/streptomycin. The whole procedure to isolate the spinal cord explants is performed under a binocular microscope, in Hank's Balanced Salt Solution (HBSS, Gibco/Invitrogen ref 14170) containing 10% Fetal Bovine Serum (FBS). It is crucial that the rat embryos are between ED 13 and 14 as a different development stage would jeopardize the whole procedure. Sacrifice a pregnant female with CO2 and collect the whole embryo chain in HBSS medium. Isolate each embryo and decapitate them for euthanasia. Dissect the embryo spinal cord from the rest of the body in one piece and remove surrounding muscle and connective tissue. Be very careful to keep the dorsal root ganglions (DRGs) attached to the spinal cord to ensure functional innervation. Slice each spinal cord transversally in a way that each explant contains at least 2 DRG attached to it (explants of 1 mm3). Remove the fusion medium on the muscle cell culture, leaving a fine layer of medium on the monolayer. Place the explants carefully on the muscle cell layer, five evenly spaced explants per 35 mm dish. Add very slowly, drop wise, fusion medium onto each explant. It is necessary to add medium for the muscle cells to survive, but not too much to allow the explants to adhere first and make contact with the cells. If the medium is not added properly (too strongly or too much medium), the explants will float and will fail to innervate the muscle cells. Once the explants start to adhere, top the fusion medium to 2 ml per 35 mm dish, and put the dishes very carefully back into the incubator. Change the fusion medium twice a week. As soon as two days after the innervation, it is possible to see the neurites emerging from each explant and establishing contacts with the muscle cells, represented by the button-like structures (Fig 1). As early as 4-6 days after the innervation, a few individual fibers will start to contract. The contractions persist for many months, maintained simply by changing the culture medium twice a week. After about 2 weeks, the spinal cord explant itself degenerates, but the innervation is conserved. This is normal. A fine layer of nerve component stays at the surface of the muscle cell layer. This nervous network is sufficient to maintain the functionality of the motor unit. If the explants float in the medium the day after innervation, they will never adhere. This happens when the muscle cell layer is not sufficiently confluent, or when the medium is added too roughly. Sometimes, the explant adheres but no neurites will emerge. This is likely due to the lack of DRG attached to it. In that case as well, the innervation will not be established. Manipulate the dishes very carefully the first week, as the explants can still detach easily. To exchange the fusion media, add the liquid drop-wise with a minimal speed to avoid cell detachment. Figure 1. 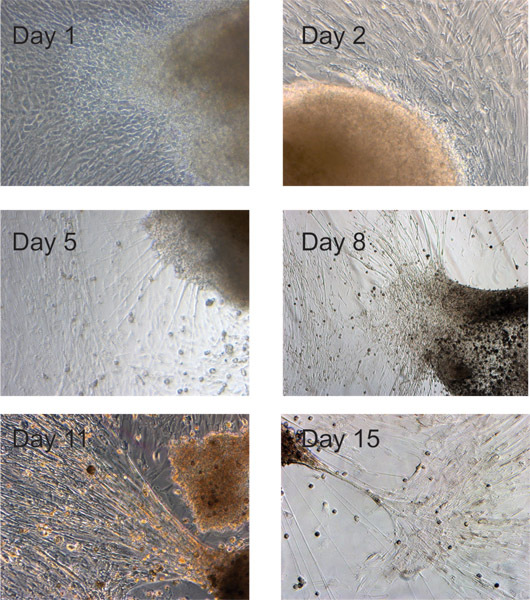 Spinal cord explants -muscle cell co-cultures from day 1 to day 15. A physiological in vitro tool to study muscle cell function in normal and pathological context is of highest interest for the myologists, because muscle cell cultures usually do not recapitulate the importance of multiple cells and cell-type connections. The addition of purified motor neurons to muscle cells is not enough to achieve a functional motor unit since the presence of Schwann cells is required for the innervation to be efficient5 and it is not topologically (3D + special distribution) relevant The protocol described here has been used successfully to establish innervated muscle cells in vitro and results in a complete NMJ maturation that can be easily assessed. The co-culture presented here also has some limitations. For example, immunohistochemistry experiments on the muscle cells are difficult to perform on this structure, because the nerve terminal embodied by the explant covers the postsynaptic NMJ apparatus. This system can also be used to assess the neurotrophic or myotonic effects of drugs in an integrated and relatively mature culture system, but it does not allow high-throughput screening, as the volume would be far too big. Curiously, the homologous nerve-muscle co-culture with both the nerve and muscle components coming only from mouse or rat is not functional and fails to result in muscle contractions. Recently however, homologous innervation between mouse satellite muscle cells and mouse spinal cord explants has been successfully performed by modification of the date of embryo harvesting (Callizot, Steinschneider and colleagues, unpublished results). Further progress in establishing routine protocols for homologous co-cultures might help to overcome the species limitation that exists for this technique today. Despite these limitations, we describe here a method that enables the study of many aspects of muscle and motor neuron physiology; a technique which is not difficult to perform, does not require any special material and that results in stable spinal cord explants- muscle co-cultures that can easily be maintained and studied for many months. Certain aspects of the protocol are of particular importance and need special care to ensure a proper innervation. First, the rat embryos have to be between 13 and 14 ED of age. Second, 500,000 cells per 35-mm dish ensures the correct level of cell confluence to facilitate adherence of the explants that are added to the muscle cells immediately when cell fusion starts. Finally, as emphasized in the protocol, the addition of the medium after the deposit of the explants on the muscle cells is the most difficult part of this procedure and should be performed with extreme care. Our work is supported by the Swiss National Science Foundation (SNF), the Swiss Initiative in Systems Biology (SystemsX.ch), the Muscular Dystrophy Association USA (MDA), the Association Française contre les Myopathies (AFM), the United Mitochondrial Disease Foundation (UMDF), the Gebert-Rüf Foundation Rare Diseases Programme (GRF), the Swiss Society for Research of the Muscle Diseases (SSEM/FSRMM), the Swiss Life "Jubiläumsstiftung für Volksgesundheit und medizinische Forschung", the Roche Research Foundation and the University of Basel. Delaporte, C., Dautreaux, B., Fardeau, M. Human myotube differentiation in vitro in different culture conditions. Biol. Cell. 57, 17-22 (1986). Kobayashi, T., Askanas, V., Engel, W. K. Human muscle cultured in monolayer and cocultured with fetal rat spinal cord: importance of dorsal root ganglia for achieving successful functional innervation. J. Neurosci. 7, 3131-3141 (1987). Braun, S., Croizat, B., Lagrange, M. C., Warter, J. M., Poindron, P. Constitutive muscular abnormalities in culture in spinal muscular atrophy. Lancet. 345, 694-695 (1995). Askanas, V., Engel, W. K. A new program for investigating adult human skeletal muscle grown aneurally in tissue culture. Neurology. 25, 58-67 (1975). Guettier-Sigrist, S., Coupin, G., Warter, J. M., Poindron, P. Cell types required to efficiently innervate human muscle cells in vitro. Exp. Cell Res. 259, 204-212 (2000). Lefebvre, S. Identification and characterization of a spinal muscular atrophy-determining gene. Cell. 80, 155-165 (1995). Schrank, B. Inactivation of the survival motor neuron gene, a candidate gene for human spinal muscular atrophy, leads to massive cell death in early mouse embryos. Proc. Natl. Acad. Sci. U.S.A. 94, 9920-9925 (1997). Hsieh-Li, H. M. A mouse model for spinal muscular atrophy. Nat. Genet. 24, 66-70 (2000). Monani, U. R. The human centromeric survival motor neuron gene (SMN2) rescues embryonic lethality in Smn(-/-) mice and results in a mouse with spinal muscular atrophy. Hum. Mol. Genet. 9, 333-339 (2000). Sleigh, J. N., Gillingwater, T. H., Talbot, K. The contribution of mouse models to understanding the pathogenesis of spinal muscular atrophy. Dis. Model. Mech. 4, 457-467 (2011). Durbeej, M., Campbell, K. P. Muscular dystrophies involving the dystrophin-glycoprotein complex: an overview of current mouse models. 12, 349-361 (2002). Schnabel, J. Neuroscience: Standard model. Nature. 454, 682-685 (2008). Benatar, M. Lost in translation: treatment trials in the SOD1 mouse and in human ALS. Neurobiol. Dis. 26, 1-13 (2007). Dorchies, O. M. Normal innervation and differentiation of X-linked myotubular myopathy muscle cells in a nerve-muscle coculture system. Neuromuscul. Disord. 11, 736-746 (2001). McFerrin, J., Engel, W. K., Askanas, V. Impaired innervation of cultured human muscle overexpressing betaAPP experimentally and genetically: relevance to inclusion-body myopathies. Neuroreport. 9, 3201-3205 (1998). I was curious as to why it is necessary for the embryos to be E13-E14. Is this because at this stage in development the DRG are still visibly attached to the spinal cord? If this is the case, could E15 embryos be utilized, since they also display such characteristics? Why is it so essential to use only E13-E14 embryos?